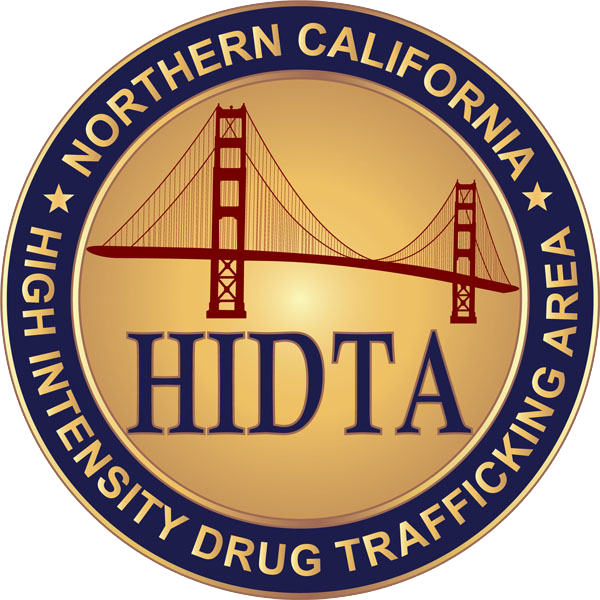 The High Intensity Drug Trafficking Area Program (HIDTA) is an important component of the President's National Drug Control Strategy which provides additional federal resources to those areas to help eliminate or reduce drug trafficking and its harmful consequences. Law enforcement organizations within the 28 HIDTAs assess drug trafficking problems and design specific initiatives to reduce or eliminate the production, manufacture, transportation, distribution and chronic use of illegal drugs and money laundering. "reduce drug trafficking & related crime and violence." Currently the Northern California HIDTA comprises 13 Bay Area counties. Approximately seven million people live in this region, which is both a major production and distribution center of illegal narcotics. Smugglers use the three international airports serving over 58 million passengers annually to move illegal drugs and money. Three deepwater ports handle over 35,000 container shipments per month. Commercial vehicles have become an increasingly popular method of smuggling with the use of the many highway corridors leading into the bay area. Northern California has increasingly become the target of Mexican polydrug organizations. NC HIDTA is composed of individual local, state, and federal law enforcement agencies within Alameda - Contra Costa - Humboldt - Lake - Marin - Mendocino - Monterey - San Benito - San Francisco - San Mateo - Santa Clara - Santa Cruz - Sonoma united in the common goal of reducing drug-related crime, violence, and abuse in our communities. HIDTA funds help federal, state and local law enforcement organizations invest in infrastructure and joint initiatives to confront drug-trafficking organizations. Improve the effectiveness and efficiency of drug control efforts to reduce or eliminate the harmful impact of drug trafficking. The global drug trade exacts a terrible toll on the American people, threatening their families, their finances, and their freedoms. The illicit drug trade also poses a serious threat to our national security due to its ability to destabilize and corrupt governments and to diminish public safety in regions vital to U.S. interests. Comprehensive and balanced drug policies can reduce the scale of both drug use and drug markets. Demand and supply reduction activities, including evidence-based prevention and early intervention programs, have resulted in fewer first time illicit drug users, significant reductions in youth drug use, and an increased perception of the health and social consequences associated with drug use. In 1996, California preceded the rest of the United States in allowing marijuana use for medicinal purposes. Now, in 2018, recreational marijuana use is fully legal for individuals 21 years and over. The San Diego and Imperial County HIDTA with contributions from drug enforcement and prevention programs across the state presents the following report examining a wide variety of ways Marijuana affects the citizens of California and outlines the current and potential impacts of current Marijuana policies. Improving access to treatment and ensuring the quality of treatment services are important steps in helping Americans obtain the care they need to achieve and maintain recovery from substance abuse. An NBC Bay Area study of local counties shows that deaths related to Fentanyl are on the rise. If you are state, local or federal law enforcement agent or supporting agency significant resources are made available to you. © 2019, NCHIDTA. All rights reserved. NCHIDTA Partner Registration Learn More Need Help?